I can’t remember when Calla drew her first dead person. It’s neither a new nor an old event. Calla has always drawn pictures, and has always spoken to the dead. I want to say one of the first drawings was a split picture. One half of a spirit drawn in their death state, one half in their life state. But they began appearing with frequency. So, a few years back, I began asking Calla to ask the spirits for names and dates, locations if they would divulge them. I began dating her pictures. They were all over the house. Some slipped into drawers, used as bookmarks some buried with drawings of Ponies and Minecraft. We never realised how many there were until we started gathering them. I would take the few details I have and plug it into the great oracle -Google. Some stories I find and some I don’t. I think many are just too old to be documented in our internet age. Having an Ancestry subscription and access to Newspapers.com helps considerably with research. I noticed with the last drawing, I may have information but no clear tie to the location. There are layers of stories to tell with every piece. But I’ll share our most recent. Calla’s sister was visiting from North Carolina. She and her fiance are also ghost fans. So we planned a day trip to Nevada City, CA. Open venues in February are hard to find. We began of course at The National Hotel. We were seated for lunch and a plan for the day. I had forgotten my voice recorder in the Jeep. The lesson learned at The Ryde Hotel, was that the SB7 and The Portal are not always necessary in such spirit-laden environments. A simple voice recorder was the equipment for the day. It was more of a scouting trip anyway. By the time I returned from the car not 5 minutes later, Calla had flipped her paper placemat over and drawn her first spirit. A man she called ‘Mr. Dawson’. She said he was playing the piano. Expecting the jazzy ragtime or perhaps wild west persona of the time periods, she showed me her work. There at the grand piano was a well-dressed man with dark, perhaps curly hair. His formal coat tails flowed over the back of the piano bench. She said he played Beethoven and preferred classical music. Her eyes momentarily gazing off. “Yes she said, just classical.” She handed me her picture and said she wanted a cheeseburger. It’s that fast. Through cursory research, I did find a Mr. Dawson that was a resident in 1856. He was a law student and writer at the time. I believe he may have been instrumental in co-founding Nevada City’s first newspaper. The co-founder of said newspaper being a Mr. AA Sargent, whose grave we visited later that day, not knowing the connection. Again, there’s much conjecture here. 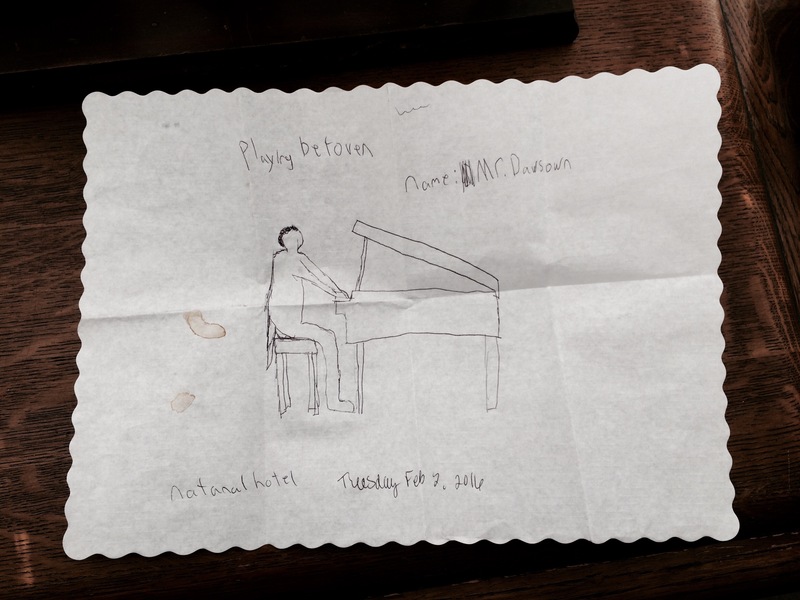 We have no documented proof yet that Mr. Dawson had dark curly hair, played piano, had a penchant for Beethoven or ever set foot in The National Hotel. We still haven’t had time to finish reviewing the recordings for EVP’s from the day. But, in such a small town, it’s hard to believe it’s not him either. More research is definitely needed. We hope to post pictures in an ongoing series, The Book of the Dead, along with Calla’s information and research finds for each spirit. Stay tuned. Ghost Travelers Greg, Casey and Calla Saumure, investigate paranormal events in and around Northern California. We love to photograph, film, fly over (with our drone), and write about our experiences in ghost travel. We focus on the history and restoration efforts of haunted locations. We always open and close with prayer, ask for spirit permission and we never provoke. Greg is the healer. Casey is the clairvoyant. Calla is the medium and artist. 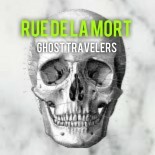 “We do this as a family, and we do it in light.” You can reach Rue de la Mort at (916)759-7880 or E-mail us with questions ruedelamort@gmail.com. This entry was posted on February 22, 2016 by csaumure in About Us, Ghost Adventures, Ghost Stories, History, My Psychic Kids, Nevada City, News, The Book of the Dead, Uncategorized.